Sinus headaches are those that may accompany sinusitis, a condition in which the membranes lining one's sinuses become swollen and inflamed. One may experience intense pressure around the eyes, cheeks, and forehead. They are felt as the dull throbbing pain in the upper face. 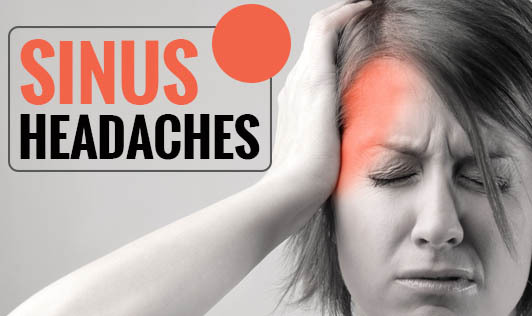 Most people who assume they have a sinus headache including many who have received a proper diagnosis of sinus headaches, actually have tension headaches or migraines. While sinus headaches aren't associated with vomiting, nausea, bright light, and noise; migraines are characterized by these typical symptoms. Sinusitis can be caused by bacterial or fungal infections, impaired immune system, and cold or structural problems in the nasal cavity. Therefore, the pressure changes in the sinuses can trigger headaches. • Wash your hands often; this can help you avoid any upper respiratory infections which can lead to sinusitis. • Avoid cigar, cigarette, and pipe smoke and any other pollutants as these may cause your sinuses to swell. • Consider using a humidifier; adding moisture to dry indoor air can help prevent sinusitis. Don't overdo it, as high indoor humidity may promote mold and dust mite growth in your home. • You have a severe headache and your symptoms last longer than ten days. • You've had numerous episodes of sinusitis within a year and have a fever greater than 100.5 degrees Fahrenheit. See your doctor to ensure proper treatment!